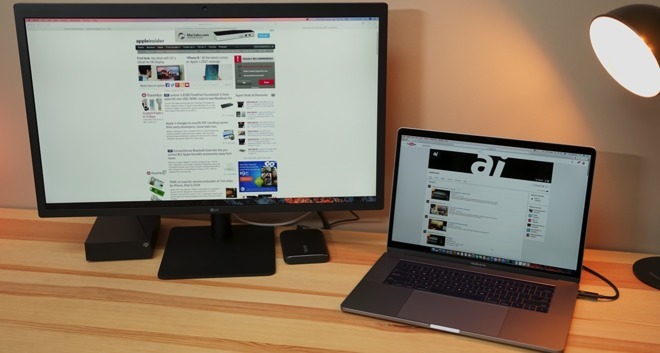 The LG UltraFine 5K Display is 27 inches diagonal, and crams in 5K ultra-high resolution, with data provided by a single Thunderbolt 3 cable making setup easier than its ever been —even with relatively ancient gear supporting the old ADC connector. Setting aside the case plastics, which we'll discuss later, the display itself is gorgeous. It implements Apple's Wide Color standards, bringing the entirety of the DCI-P3 color space to the desktop. 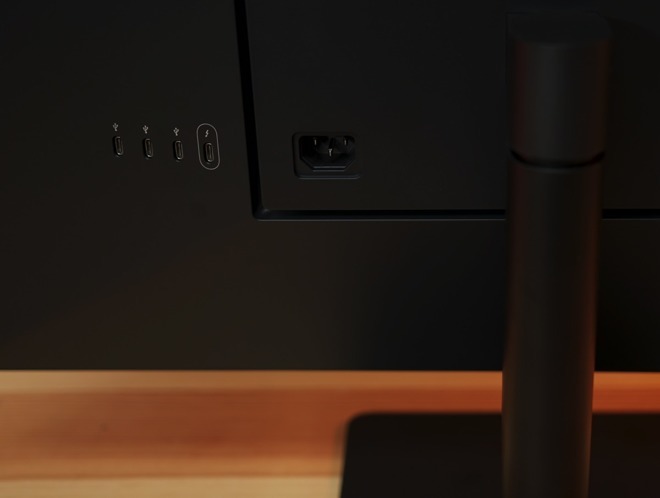 Connectivity issues induced by the only computer fully compatible with the display —the 2016 MacBook Pro with Thunderbolt 3 —is eased somewhat with a trio of USB 3.0 type C ports on the back of the display. This provides a convenient way to attach mass-storage or input devices to the back of the display, albeit at a slower speed than full USB 3.1. According to our testing, even USB 3.0 is somewhat limited in speed by the monitor. To test out how profoundly speed is affected, we connected a Sandisk Extreme 900 2TB SSD RAID through the monitor. The LG UltraFine 5K Display is here now —we're expecting it to stay on the top of the heap for a while, at least. Direct to the MacBook Pro, the RAID managed 887MB/s read speeds, and 723MB/s write speeds, with large files. Connected through the display, the enclosure only managed 348MB/s read, and 317MB/s write. A single PNY 480GB SSD had similar throttling. Directly connected, the drive managed 400MB/s read and 388MB/s write. Through the display, read speeds were limited to 333MB/s and 263Mb/s write. This only gets worse as more drives are attached, but that's to be expected, given that the the data needs of the 5K display itself are not all that far from saturating the Thunderbolt 3 connection. However, why even the slower drive, that isn't close from filling the pipe is slowed, we can't tell, nor is Apple or LG talking about it. If the peak speed is needed from an external SSD RAID, stick with connecting the enclosure directly to the computer. 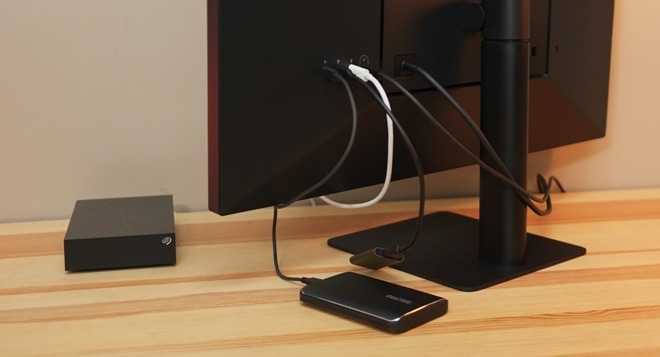 The LG UltraFine 5K Display does connect to older Thunderbolt 2 equipment through Apple's Thunderbolt 3 to Thunderbolt 2 adapter. The monitor is limited to a still very nice 4K resolution, and it does not keep the DCI-P3 color space. 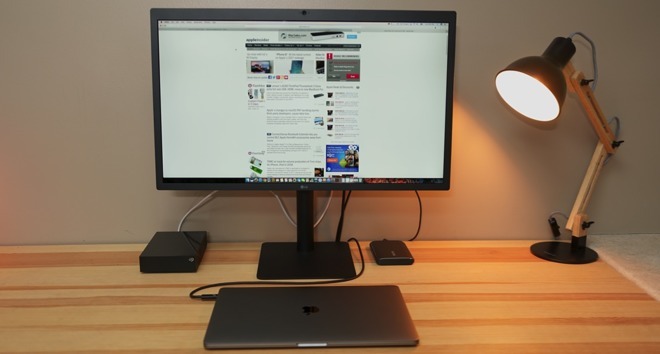 Apple recommends that with the 2014 Mac mini and Mac Pro, that the display be used as a secondary monitor, as the monitor won't turn on until macOS has sufficiently progressed through the boot process. Otherwise, the boot picker for choosing which OS to boot into and recovery mode are not usable. We have a hard time recommending the monitor for older hardware, however, unless an upgrade to a Thunderbolt 3-equipped Mac is imminent. It's just not a cost-effective choice, with 4K options from other companies available at a significantly lower price. While 4K at 30Hz is doable on Thunderbolt 1 connections on the original 15-inch MacBook Pro with Retina Display from 2012, don't even try it with the LG UltraFine 5K. It doesn't work at all. The display is usable in Boot Camp with no connection issues, and the USB connections and integrated camera work in Windows too. We've found across an assortment of Windows PCs that the display runs in 4K resolution, but is subject to periodic, random, disconnections and reconnections lasting about a second. Regardless of how you approach the monitor from Windows, brightness and other monitor parameters can't be adjusted, with brightness stuck at about 50 percent. We suspect that LG will issue a driver for Windows 10 shortly, rectifying both the 4K and disconnection situation. But for now, the monitor is technically Mac-only. Users with older BootCamp installations should update their Apple-specific drivers first, before connecting the monitor. Our only problem with the monitor is that there's no real sense of style attached attached to the display, like we're used to in every Apple-manufactured flat panel display since the blue and white G3-styled flat-screen. LG attempted make the monitor palatable to the wider computing world at some point in the future who want no Apple fingerprints on their technology, so to speak, and that's left us with an ugly, and perhaps too-large bezel. Apple users are used to a "chin" on the iMac. While nowhere near as large, the LG sports the extra bezel on top of the display, in a slightly-oversized "forehead" that holds the FaceTime-compatible camera. We understand that there's some extra circuitry required for the camera, but the non-symmetrical upper bezel is distracting. If you can look past style issues, the display is an amazing performer, and fabulous for photographers and videographers —especially those needing a 4K production workflow. With DCI-P3 Wide Color, images and video are crisp, connectivity is easy with Thunderbolt 3, and the display performs well in nearly all office conditions. While there have been a rash of 5K displays unveiled at CES, to ship at some indeterminate time in the future, the LG UltraFine 5K Display is here now —we're expecting it to stay on the top of the heap for a while. Score: 4 out of 5, until BootCamp drivers are available and USB 3.0 connectivity speeds are worked out. After that, then 4.5 out of 5. The LG UltraFine 5K Display is currently available for purchase only at the Apple Store. Special pricing is in effect at $974.00, although online orders have a 2-4 week wait. Shoppers can sign up to be notified when the display will arrive at B&H with free expedited shipping and no tax collected outside NY.